Darkness into Light (A Christmas Musical Journey (SATB Choral Score)). Composed by Mary Mcdonald. Choir Sacred. SATB choir. This edition: SATB Choral Score. Choral (Sacred); Choral Worship Cantata; Larger Works; Score; Worship Resources. Christmas; Sacred; Winter. 88 pages. Published by Alfred Music (AP.42933).ISBN 1470616750. Christmas; Sacred; Winter.Just as Mary and Joseph moved from darkness into light, so do all when accepting the One True Light. 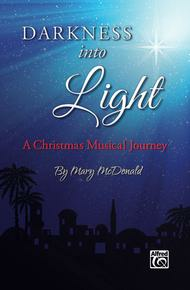 This new 40-minute adult Christmas musical from Mary McDonald features fresh settings of carols along with beautiful new songs, and celebrates the Light of Christ. An optional candlelight moment is included, along with inspired narration and lighting suggestions to heighten the darkness into light theme. Reproducible Rehearsal Trax feature part-dominant tracks.Inst. Parts Available (choral); Recorded Acc. Available.